Last time I described voluntary associations in Finland and their importance in elder care and the development of the social welfare system in general. 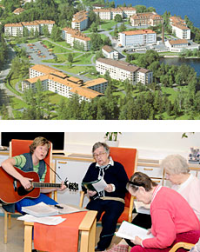 Today I have two examples of associations in Tampere that provide services for older adults. One is Mummon Kammari (Granny’s Corner). Mummon Kammari is an association of older adult volunteers and a drop-in center. 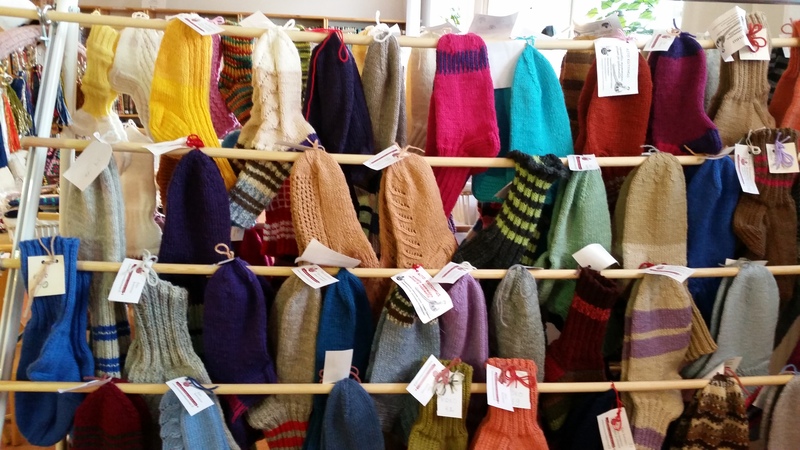 Founded in 1989, it was the first of its kind to be established in Finland. It is funded by the Lutheran church. The drop-in center is open four hours a day, four days a week. About 100 people, ages ranging from 50 to over 90, come through on any given day and most of those do some volunteer work while they are there. “They are not just ‘Granny’s’”, I was told. “They are volunteers – that’s the main point.” “Granny’s” are those older adults, men and women, who call or visit the organization requesting some sort of help. A son or daughter may also call, or the City of Tampere may refer an older adult who is receiving services from them to the organization. So, while about 400 volunteers do work at the agency itself, another 1,000 visit “Granny’s” in their homes. Volunteers take them out, help with small chores, help them to the doctor, or just keep them company for a while. It’s a small organization with seven staff and little hierarchy which helps it stay nimble and make quick decisions. This is important for its other role as an incubator for community-based projects. For example, they used to provide volunteers to visit elder care homes and hospice. Those projects got big enough that they have since spun off on and have volunteers and infrastructure of their own. Mukanetti, the other association I visited, is one of these projects. 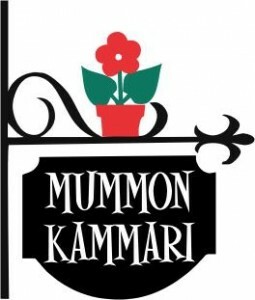 It started 15 years ago at Mummon Kammari with one person, but grew so big that it became an association on its own funded by Finland’s slot machine association (perhaps a post on that another day). Mukanetti provides computer training and support to older adults in the Tampere area. This includes a drop-in center (MukaSurf) that is open four hours a day (except in Summer); classes on topics ranging from Windows 8 to security issues to using Skype and Dropbox; and tutoring in older adults’ homes, at public libraries, and in senior residential facilities. Yes, this is all done by volunteers, about 60 of them. And yes, those volunteers as well as the people they serve are 50 and older. While I was there I met the oldest member working in the office. She is in her 90s. The volunteer who I met with is in her 70s and used to work on IT development at Nokia. Membership is 25€ a year. Except for the classes, the other services are at no additional cost. Classes are open to non-members too, but for a slightly higher fee than that paid by members. That’s a lot of services and this is only two of the many voluntary associations in Finland. Uttanasana, standing forward bend, is one of my favorite poses. When I feel a migraine starting, a minute in uttanasana can ease or delay it and sometimes, if I catch it early enough, make it go away altogether. Uttanasana is on my mind today because my hamstrings are so tight I can’t do it properly. Why are my hamstrings so tight? From weeding for about 30 minutes. Sad, but true. In order to even approximate the pose today I have to prop my head on something. The piano bench works nicely for the time being. After I bend and straighten my legs in this pose for a while, I should be able to gradually lower my head prop until I don’t need it any more. Oh, look. There’s a puppy that’s about the right height. Nope. Too squirmy. Oh well. Most of the time this pose isn’t really about stretching the hamstrings. Yes, they are involved, but on the best days uttanasana for me is about releasing the spine. When I’m loose in the hamstrings and the hips, gravity does all the work, pulling my head toward my toesies and stretching and lengthening the spine. It also encourages me to breathe more into my back ribs than normal since my front is a bit squished which helps stretch the cartilage between those ribs and keep them supple. And who doesn’t want supple rib cartilage? Seriously, it’s important for deep, full breaths and can help prevent breathing problems later down the road. When I stand up, I feel taller and my head feels like it’s floating on my neck instead of jammed down into the top of my spine as it often does. Maybe I am actually taller. Not too long ago, when I went to the doctor for a checkup, the nurse was amazed to discover that I was a centimeter taller than before. I’m pretty sure any growth spurts are long past for me and that uttanasana, and my yoga practice in general, were the cause. 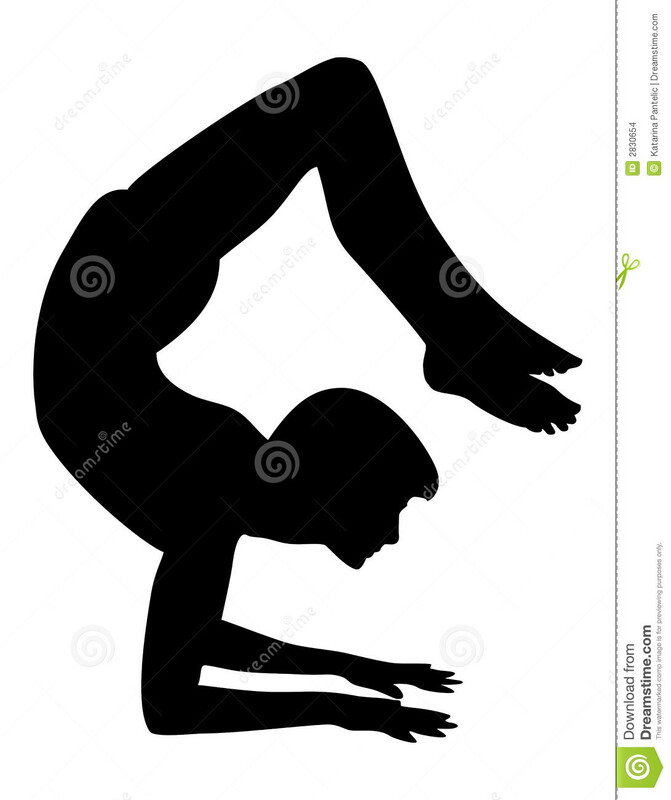 What does uttanasana do for you? The title of this post is a bit of a misnomer because I’m not actually in Finland any more. Sadly, my 7 weeks in Tampere have come to an end. I’m glad to be home and was very happy to sleep in a pile of quadrupeds last night, but I already miss my Finnish home away from home. Of course, I’ll be back. There’s still lots of work to do and I didn’t make it to Estonia or Romania so I have those adventures to look forward to as well. Now I am readjusting to this time zone, to saying “thank you” instead of “kiitos”, and to darkness and lightning bugs (a stranger transition than you might expect). I’m also continuing to sort through some of the things I’ve learned. Today I’m thinking about voluntary associations in Finland and their role in elder care. I haven’t quite figured out yet what the U.S. corollary is to Finland’s voluntary associations. I’m also not completely sure yet of their history and role in Finland, at least not beyond the superficial level of description I’m writing here. More on these topics later since it’s clear that this needs to be a section in The Book. For now . . . Since Finnish independence in 1917 over 170,000 voluntary associations have been founded. In 2011, there were approximately 90,000 registered associations and who knows how many unregistered, referred to in two articles I read as “wild” associations which makes me smile and conjures up all sorts of amusing images. (In fact, I just spent a fair amount of time staring out my office window day dreaming about the habits of voluntary associations in the wild. That might be the jet lag.) More than 80% of Finns belong to at least one association. Associations focus on a variety of things ranging from politics to hobbies and sports. Their historical roots lie in working for political and social causes, but over time the participation in political associations have given way to more exercise and sports clubs, cultural, and other leisure associations. In fact, almost three-quarters of associations registered in 2000 to 2002 were these types of “lifestyle” associations with more focus on self-development and less on reaching social goals. Voluntary associations in Finland, and Nordic countries more broadly, are particularly important because the welfare state evolved from them. Their role has been to mediate between citizens and the state or the municipality. They created networks of people with similar interests and goals and through those networks communicated information, goals, ideologies, and wishes throughout the community, and sometimes from the grassroots up to the state. Associations in conjunction with broader social movements advocated for and helped organize the welfare state. This close relationship between associations (made up of the citizenry) and the state helped create the trust and confidence necessary for the Nordic welfare institutions to function well. This is something I want to explore more. I visited a few associations while in Finland. Next post I’ll describe a few of them, the work they do, and their relationship to the broader welfare state. 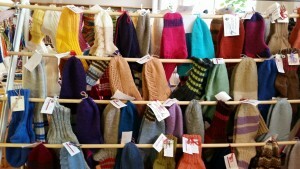 Handcrafts for sale at one Finnish association I visited called Mummon Kammari (Granny’s Corner). I love yoga. I feel calmer, taller, more limber, and happy after a good yoga session. I particularly love Iyengar yoga which I have studied off and on with Lynlee Sky at the Yoga Practice Center for almost ten years. Lately that has been more off than on. Despite how good it makes me feel. Despite the pleasure I get from studying a pose and the similarities and differences across poses. Despite the happy atmosphere in Lynlee’s classes. Despite the fact that her studio is only five measly minutes from my house. Yes, I admit it, I have fallen off my yoga mat with a resounding thud. I’ve decided to decide that this is because I am entering a new era in my yoga practice. (I declare this loudly to drown out the internal voices that say I’m just lazy). I would say that this new era is one of a more personal, individual practice, except that I’m posting about it here for all the world to witness. But, it’s clearly time to try something new. Hence a new series on my blog. I’m not making any bold declarations about daily practice, two hours sessions, or a five minute head balance by the end of the summer. But I am going to practice and I am going to share something about it here. If you want to climb back onto your yoga mat too, feel free to join me. 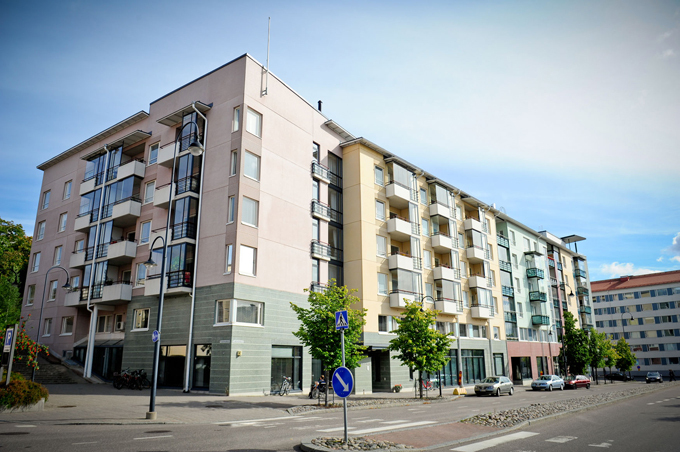 In Finland, when you enter residential care you are renting an apartment. It’s your home – there just happen to be services, such as food and nursing care, attached. Staff don’t enter your home without knocking. The fee for services depends on how much you need and your income. The rent depends on the size of the apartment. In both cases, help is available to pay for these services depending on your income. If you can’t pay at all, the municipality pays for you. Koukkoniemi home for older adults. A larger facility in Tampere. Residential care facilities include those run by the municipality as well as private facilities that have apartments that residents pay for out-of-pocket and apartments purchased by the municipality. The size and quality of facilities can vary. Some of them can be quite large and feel more like a hospital with a nurses’ station and long, sterile hallways. Others are smaller and feel more homelike. These tend to have a cozy common area and staff are less separated from the residents. Some large facilities are divided into smaller units that mimic this more homelike atmosphere. There are very few facilities left analogous to what we think of us nursing homes in the United States. Even places where the residents need a substantial amount of care are more likely to be structured into smaller units and the underlying philosophy is that this is the residents’ home and should be treated as such. Many places have courtyards or other outdoor areas and some of these include small gardens where residents can pick berries or dig up potatoes. All have saunas available for residents to use. These are important for quality of life as regular saunas and outdoor activities are important parts of Finnish culture. There is a formal process for entering residential care. It begins with a referral from the municipal social worker or perhaps the family. Typically there is a waiting list. By legislation the wait for residential care should be less than three months, however, there is currently a longer wait in many places. Once you are on the waiting list, you are given a place in the next facility that has an opening as long as it is suitable for your needs. You can decline it if it is not where you want to be, but then you go back onto the waiting list. The municipal social worker manages the waiting list and can move you up in line if your situation changes. Of course, if you can afford it, you can pay out-of-pocket for an apartment in the facility of your choice and the wait may be shorter. The criteria are high just to get into the queue. The social worker visits the home and does a complete biopsychosocial assessment. This assessment is then reviewed by an interdisciplinary group made up of a doctor, physiotherapist, nurse, hospital social worker, and a social worker from community care. They decide whether or not you are accepted into the queue. This group meets once a week. Sometimes they require additional evaluation before they will make a decision. It is a very time consuming and bureaucratic process that can be difficult for the older adults and their relatives. Viola Home in Tampere won an award in 2009 from the International Academy for Design and Health. How does this compare to your experience or knowledge of residential care for older adults in the United States? When I first got here I envisioned frequent posts about my experiences here. And then suddenly it is June! 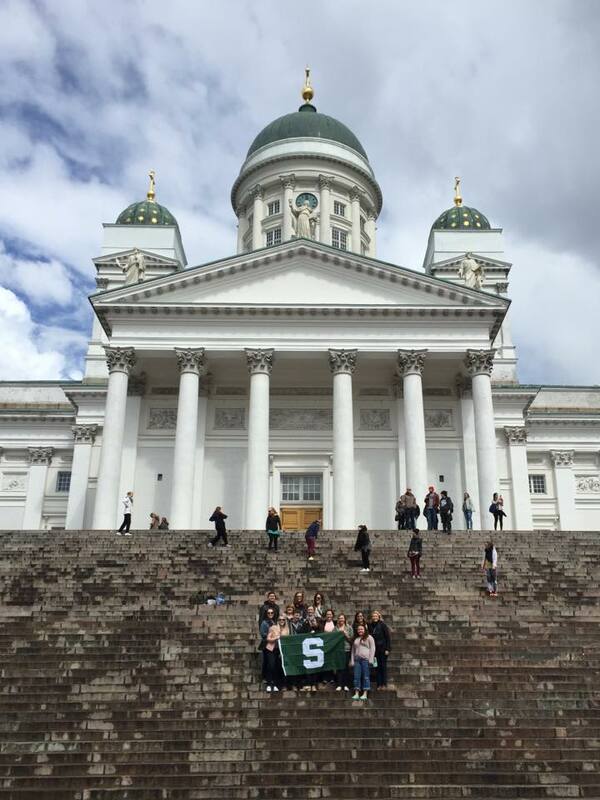 This week Masters of Social Work students from Michigan State University were in Tampere with my colleague Karen Newman as part of our MSU – Tampere of University of Applied Sciences exchange. They visited a variety of agencies, had class with Finnish MSW students, and had fun learning about social services here, the Finnish culture, and the ways we are the same and different. I’ve learned a lot in my time here as well. Thanks to my collaborator Ulla-Maija Koivula for putting together a great program for the students and making my time here so pleasant and productive. (Here are are some blog posts by Ulla-Maija and her students who visited the United States in Fall 2013. Sorry – it’s in Finnish, but there are some pictures and headlines that will give you a sense of where they went). The focus for elder care and the issues Finland is facing are also similar to those in the United States. In particular, there are more resources being put into caring for older adults at home for as long as possible so that residential care is a final resort. Consequently, older adults are in need of more care by the time they enter residential care, although staffing has not always changed to accommodate this greater need. The City of Tampere has been quite thoughtful about how to manage this shift. For example, they closed geriatric residential units in a local hospital and used that money to fund a start up project for an in-home rehabilitation program. After a year of getting the program off the ground, it has become integrated into overall home health services as a means of improving customers’ quality of life and helping them stay at home longer. This service isn’t free, but older adults pay on a sliding scale based on their income. The balance is covered by the municipality and for those who can’t pay anything the full cost is covered. As in the United States, the people who do this work do it because they love it and they love the people. It’s hard work that can be both physically and emotionally draining, but the people I have spoken to have a passion for it. Unlike the United States, there is very little turnover in residential care staff in Finland. I need to delve into the details and reasons behind this a bit more. Two initial thoughts that come to mind include better financial supports (including salaries as well as the overall health and social services available to workers and customers) and the country’s investment in education (which is free at all levels) which means that workers in all roles tend to be better educated. The decision to enter residential care is not entirely up to the older adult and his/her family. More on this later, but in a nutshell, an interdisciplinary municipal board made up of health care professionals evaluate the situation of the older adult and if he/she meets the criteria they will be placed on the waiting list. When they reach the top of the list, the next available place will be offered to them which may or may not be in the facility of their choice. More thoughts about differences and similarities in future posts. And if anyone has suggestions for slowing down time, please let me know.